My Knuckle Dragger series is the result of several years of design evolution resulting in a rubber legged golden stonefly jig that actively swims when fished under tension. 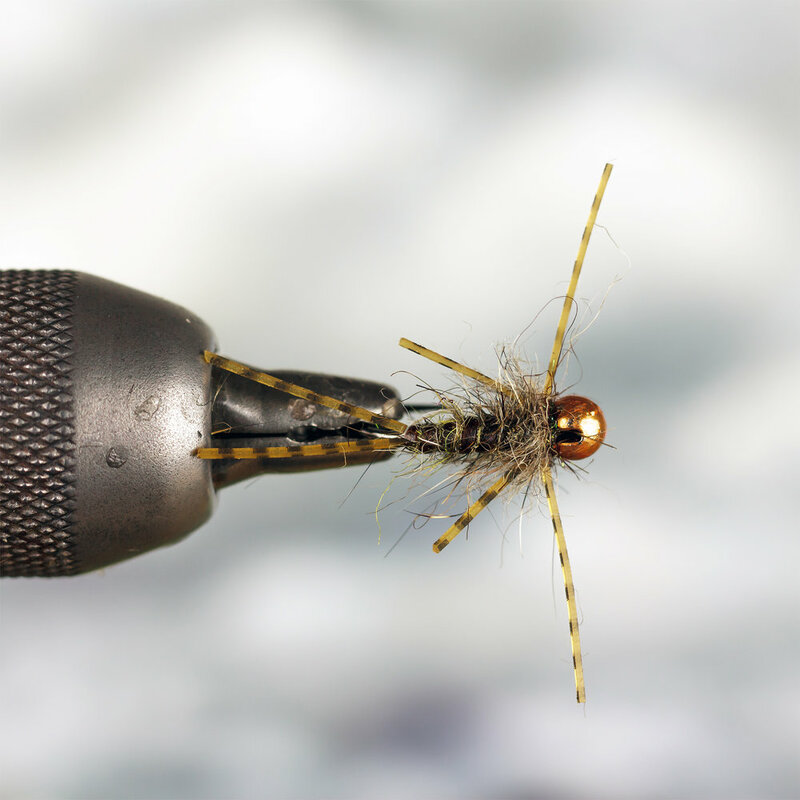 The trouble with rubber legged stonefly patterns tied on jig hooks is the legs fouling around the hook bend. I fixed that issue by lengthening the forelegs and keeping the rear legs just short enough to not foul. The result was astonishing; the front legs activated lifelike motion in the fly when affixed to the tippet with a loop knot. It is the long front limbs that give the fly the name of Knuckle Dragger. Rib: Hends half round body glass red brown. Abdomen: Olive hares mask fur. Thorax: Dark olive squirrel blend. 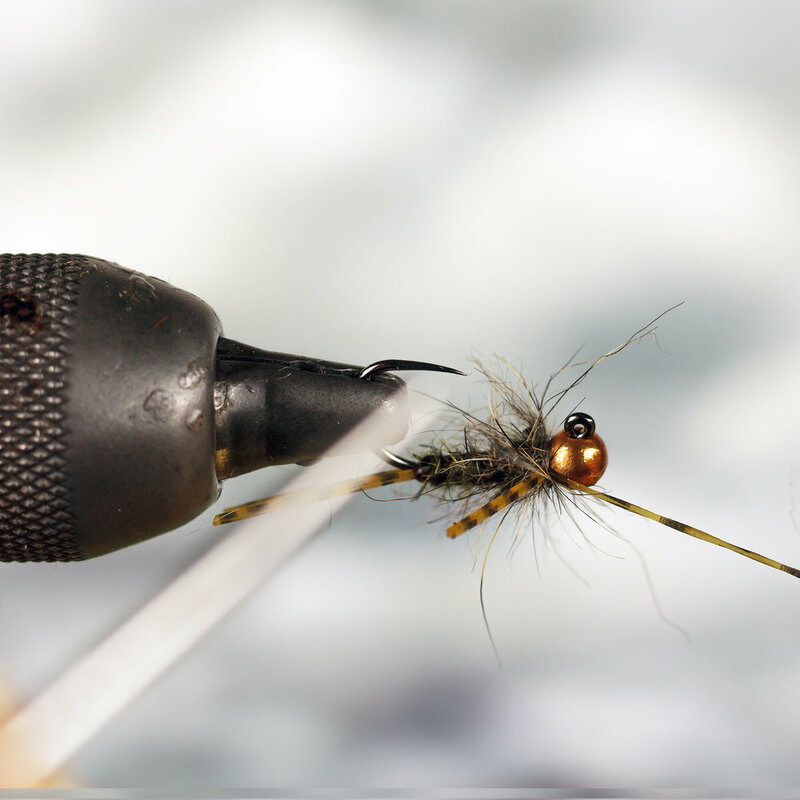 Mount a slotted bead and establish your tying thread on the hook shank. 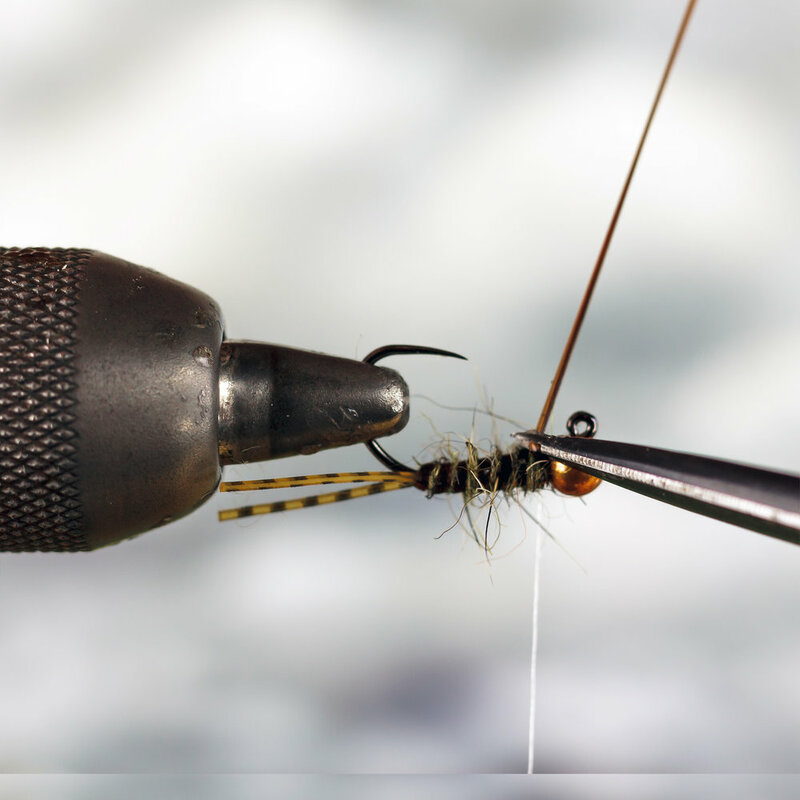 Fold a section of rubber legs in half and mount onto the top of the hook shank. Cut a wedge from one end of your body glass and mount flat side facing out along the bottom of the hook shank. This will help you keep bulk down. Take 3-4 strong compression thread wraps to affix. When you have the material firmly mounted, stretch the material as thin as you while advancing the thread rearward close touching, compression wraps. Dub the thorax. Pay special attention to creating a nice smooth tapered abdomen. Advance the ribbing forward. Stretch the material to form a taper following the taper of your dubbing. I strive for 6-7 turns of the ribbing. Make sure to use strong compression wraps to tie off the body glass behind the bead. Apply a fat pinch of dubbing to the thread and roll into a loose noodle. Wrap this around the collar one or two wraps only. Pinch and prune away the extra fluff leaving very scruffy. Measure out a length of rubber legs and mount each one on each side of the collar. Do not use too firm thread pressure as to distort or cut through the rubber. Pinch a small amount of collar dubbing tightly around the thread and work a wrap or two around the rubber legs. Pinch a very small amount of Spectra dubbing to form a small collar. this will also act as a means of obscuring the tying thread. Whip finish and cinch the thread tightly behind the bead. Cut the rubber legs to length, Cut the tail to be the same length of the body. Cut the rear pointing legs should be no longer than the length of the body, and the front 1.5 times the length of the rear legs.